You can have Charlie’s Pride premium meats conveniently pre-sliced. Pre-slicing is a clean, easy and economical alternative. It increases yield, reduces labor and eliminates the need for hazardous knives or meat-slicers. Vacuum-sealed for freshness, Charlie’s pre-sliced items are a fast and efficient way to serve Charlie’s delicious meats without sacrificing on quality. 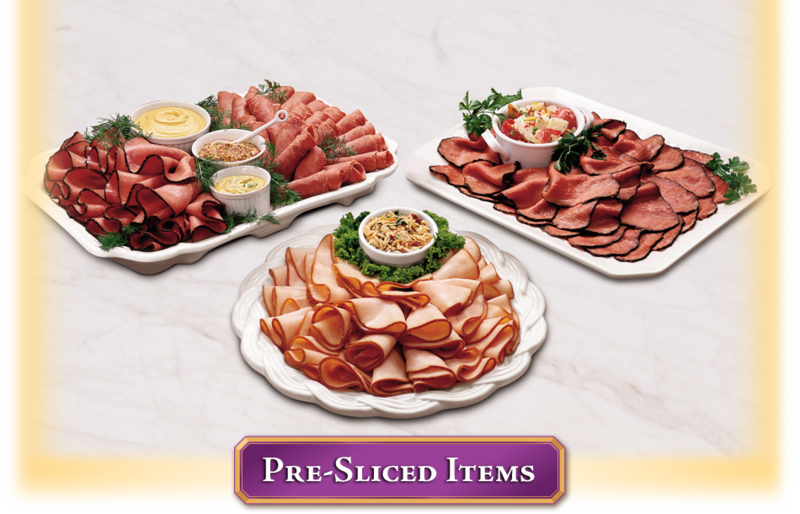 You can feel confident that you have chosen the world’s best pre-sliced meats. All of our Pre-Sliced products have 0g Trans Fat and No MSG Added. Very lean, tender and juicy. Available non-injected, seasoned (back-to-beginning weight), with a 10% solution, or with isolated soy protein added. Retail pack size: 4 oz, 8 oz, 16 oz. Foodservice pack size: 1 lb, 2 lbs, 5 lbs. Available from the Top Round, Flat, Eye of Round and Brisket. Flavorful item. Cured and cooked to perfection. Serve hot or cold. Available in back-to-beginning weight, with a 15% solution, or with isolated soy protein added. Flavorful item. Seasoned and cooked to perfection. Serve hot or cold. Foodservice bag size: 1 lb, 2 lbs, 5 lbs. Available from the Top Round, Flat, Eye of Round, Brisket and Navel. Can be ordered with a Western or New York rub. Lean and juicy. Roasted to perfection.